Compress MOV videos with super fast speed and no quality loss on Windows/Mac. Reduce MOV file size by changing bit rate, video resolution, format, and other parameters. Edit MOV videos before converting size with trimming, cropping, rotating, adding watermarks, etc. Developed by Apple, MOV is a container file format that is capable of storing video, audio, and text content in a single file. MOV files are high in quality and large in size which makes them difficult to share over the internet and store. That's why so many people are looking for ways to compress MOV file online as online solutions are always free and easy to use. 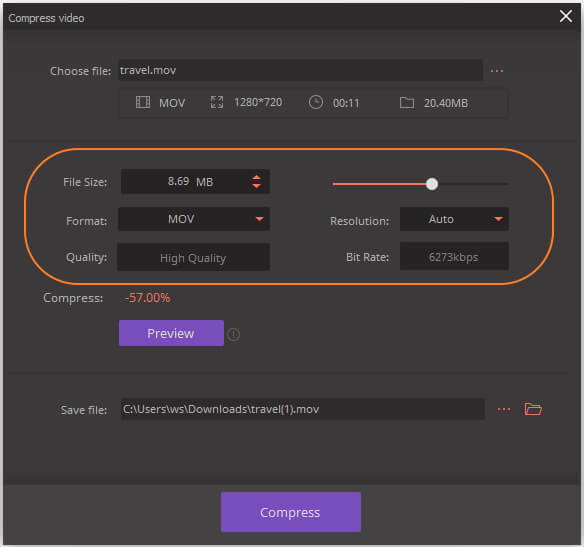 However, is online MOV compressor the best way to compress MOV videos? Find your answer by reading the following parts about how to compress MOV online and other ways to compress MOV files. Among the long list, Online UniConverter (originally Media.io) is a decent tool to compress MOV online. Using the program you can add MOV files from your PC/Mac, change their resolution and size to compress the file. There is also an option to change the file format to make them compatible playing on your choice of devices. Online UniConverter (originally Media.io) works from your browser and needs no download or installation. The compressed MOV files are in good quality and without any watermark, and can be downloaded to your computer or save to Dropbox. 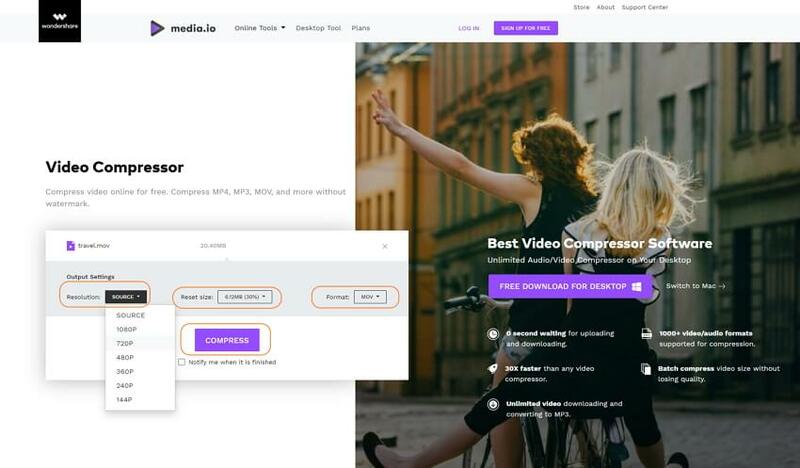 Step 1: On your PC browser window, open https://www.media.io/video-compressor.html. Click on the + sign or the Drag & Drop or Hit to Add File button to browse and add MOV file from PC. You can also drag and drop the MOV file directly. Step 2: There are 3 options for you to compress .mov file online. Click the drop-down icon next to the Resolution button to change the video resolution. Hit the Reset size drop-down option to choose the compressed file size. And finally, choose MOV or any other video format as the output format. After all settings are saved, click on the COMPRESS button to start compressing MOV file online and free. Step 3: The online MOV compression process will be finished soon according to your network speed. Click on the DOWNLOAD button or the drop-down button to download the compressed MOV file or save it to Dropbox. Limits on the file size: Majority of the online programs have a limitation to the maximum size that can be added to the program for compression. Thus if you want to compress large sized videos, online tools are not the right choice. No editing features: Online programs are basic tools without any support for editing features. So if you want to customize your MOV files with features like cutting, cropping, adding special effects and others, an alternative has to be looked for. 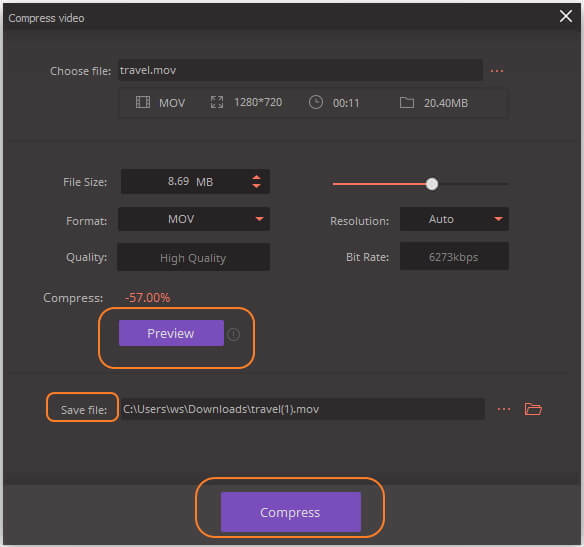 Cannot preview compressed effects: When you reduce MOV file size online, the tool does not support any preview function where you can check the effects and the changes that will arise due to the compress feature. No batch compression support: Online tools allow adding one file at a time for compression as there is no support for batch processing. So to compress multiple files at a time, an alternative to the online program is needed. Considering above limitations, it is clear that professional software is the best choice to get lossless quality compression for all your file types. To get the task done in a seamless way, we recommend Wondershare UniConverter (originally Wondershare Video Converter Ultimate) as the best alternative to compress MOV online. This complete video-toolbox facilitates compressing MOV as well as all types of audio and video files in just a few steps. The parameters of the files can be changed as needed to shrink the file for easy sharing over the net, email, and other sources. The preview function lets you check the effects of the compression before the process takes place. Wondershare UniConverter also works as an excellent video converter and editor to take care of all your video needs. 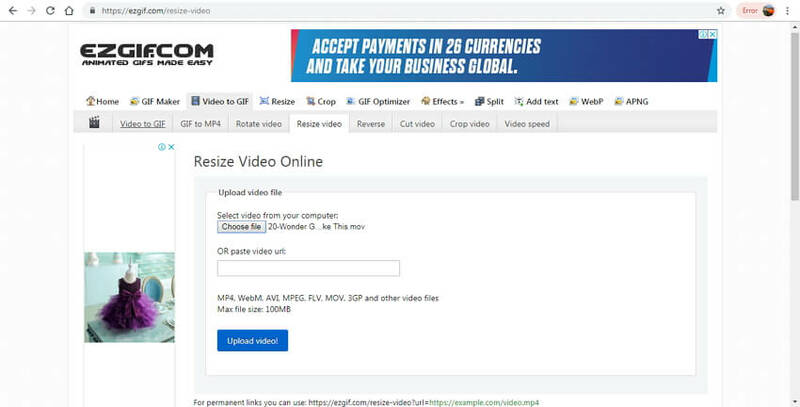 Compress MOV videos by changing video size, resolution, quality, bit rate, format, and other parameters. Reduce MOV file size with super fast speed and no quality loss on Windows/Mac. Edit MOV videos by trimming, cropping, rotating, adding watermarks, applying effects, editing subtitles, etc. Convert and compress MOV videos to other 1000+ video formats in a smaller size. Support batch process to compress MOV videos and audio files easily. Transfer compressed MOV videos from PC/Mac to iPhone/Android devices via a USB cable. Run Wondershare UniConverter (originally Wondershare Video Converter Ultimate) on PC/Mac and select Video Compress functions from the Toolbox tab on the main interface. To browse and add local MOV files, click on the + sign from the pop-up window. The added MOV file with its size and other details are displayed on the pop-up window. To reduce the file size, you can change the bit rate, frame rate, resolution, and also the format of the added file. Alternatively, a progress bar is also present on the window that can be moved to choose the compression percentage that will change the file values accordingly. Check the effects of compression by clicking on the Preview button. At Save file: option, select file destination to save the compressed MOV video. Finally, hit on the Compress button to start the compression process. 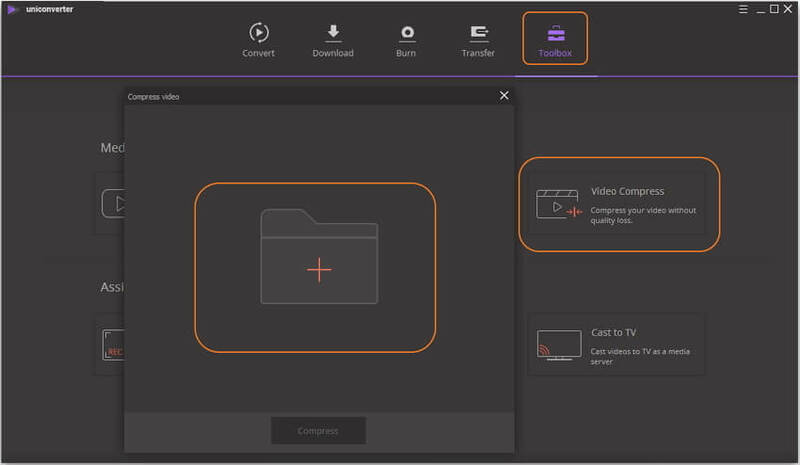 If you want to learn more methods to compress .mov files on Windows/Mac with Wondershare UniConverter, just go to 3 Ways to Resize MOV Files Easily >> to read more details. Using VideoSmaller, you can compress MOV file online free. The program supports adding a maximum of up to 500MB files that can be reduced in size by changing their width. To get high-quality output files, there is an option for low compression level. To further reduce the size, mute videos can also be created by removing the audio. The program has an intuitive interface and the process is fast. With YouCompress, reducing MOV file size is a quick and simple process. Working straight from the browser, the program needs no download installation or registration. You simply have to add the MOV file to the interface that will be uploaded and compressed using the best algorithms. The processed file can be downloaded on PC as needed. With EZGIF, you can reduce MOV size online by altering its height and width. The process of compression is simple where a file can be added from PC or from an online source through a URL. While changing the height and the width of the file, the percentage of the compression is shown by the program. Output format and encoding can also be selected from the given drop-down menu. The resized video is available at the interface itself for downloading. 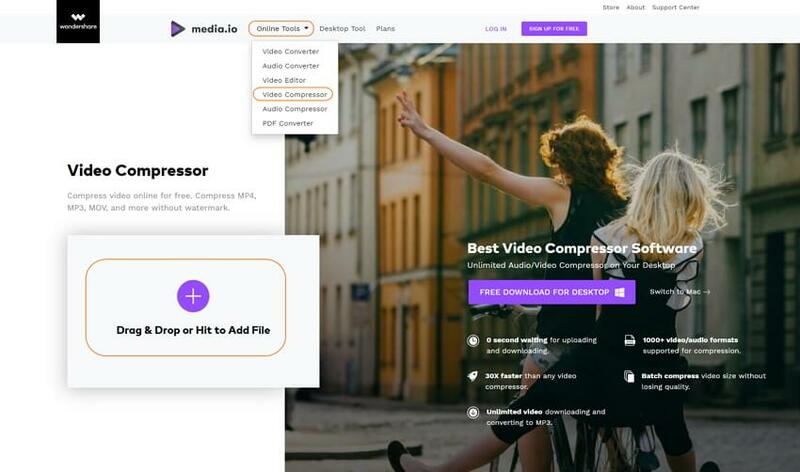 Check the features and functions of the above-listed MOV video compressor online tools and select the most appropriate one. 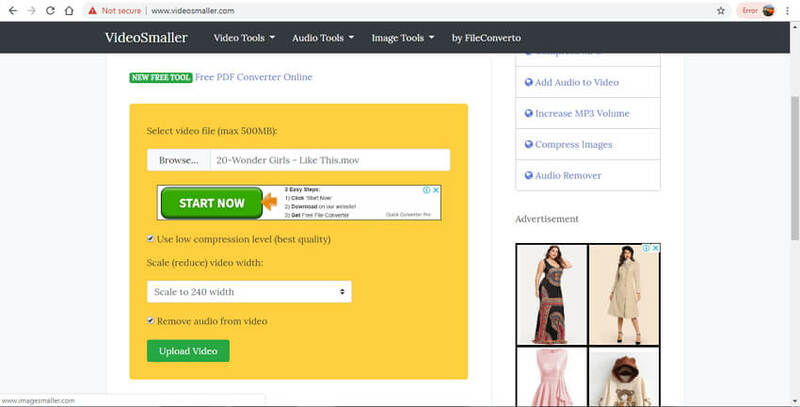 For excellent quality and additional functions, Wondershare UniConverter (originally Wondershare Video Converter Ultimate) is most recommended MOV compressor.